1. Rinse and chop up your chicken. Toss it into the bottom of the largest pot you own (a stock pot or a dutch oven works well). 2. Soak your salted fish or pork in water to get rid of the extra salt and preservatives. Set aside for later use. If you don’t have access to salted fish or pork or simply prefer making your own, liberally salt a piece of pork overnight and then rinse off when ready to use. 3. Prepare your seasonings and herbs. Peel the garlic, slice the onions, seed and chop peppers. Chop up celery sprigs, thyme, and basil. Throw everything into the pot, on top of the chicken. 4. Chop the breadfruit in half and let it rest for 15 minutes. They will dispel some sticky liquid that you can then rinse off. Quarter the breadfruit, slice off the core and peel. Layer over the spices. 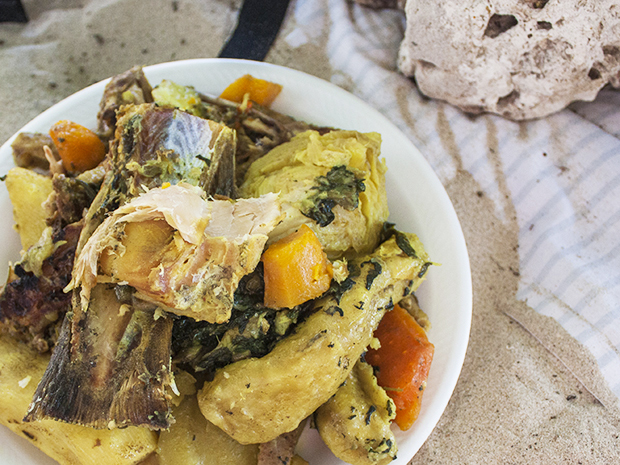 As a substitute, you can use canned breadfruit or taro root. Breadfruit has a very unique, spongey texture, so taro doesn’t really do it justice, but it will soak up the coconut milk all the same. 5. Peel the green bananas and rinse them off. Peeling these guys can be really tricky! It took me and my friends a good five minutes to peel each banana, but our Grenadian friends could do them in about a minute. Substitute potatoes or another starch if you’re unable to find green bananas. Plantains don’t really work very well as a substitute because they are still quite sweet. These green bananas are not sweet at all and taste very similar to potatoes or taro when cooked. You can omit them altogether as well. 6. Peel and chop up the carrots and yams. Place them on top of the green bananas. 7. Remove your fish or pork from the water and rinse well. Scrape off any skin, fins, or otherwise undesirable parts. ;) Layer on top of the carrots and bananas. 8. Now it’s time to add in the coconut milk! We have the luxury of having access to fresh coconuts and coconut milk in Grenada. Even if you don’t feel like cracking your own coconuts, you can buy frozen, local coconut milk and shredded coconut at the store there. Next, you’ll peel off the hard shell. It’s not necessary to peel off all the dark skin inside the shell since we’ll be grating the coconut anyway. Grate the coconut chunks and the fresh turmeric into a large bowl. Fill the bowl with six cups of water. Gently massage the coconut and turmeric mixture until the water looks milky orange. Squeeze out the liquid from the pulp with your hands. Discard the pulp (or save for another recipe). Strain the remaining pulpy liquid through a fine-mesh strainer. Pour the liquid into the pot, reserving 3/4 cup of it to make dumplings . There should be enough liquid to cover the ingredients. 9. Place the pot on the fire (stove) and let it start simmering. 10. Meanwhile, add in the cabbage. Quarter them, leaving the core in place so the quarters stay intact. 11. As the pot is simmering away, make your flour dumplings by mixing the coconut-turmeric liquid with 2 cups of plain flour. Roll the dumplings into long logs and place over the cabbage to cook. 12. Lastly, rinse and chop up the callaloo into small pieces. Place on the very top of all your ingredients to seal everything in and cover firmly with a lid. 13. In about 20-30 minutes, you should start smelling the aroma of all the spices, meat, and coconut milk mixing together. Traditionally, the dish is finished when all the liquid has been absorbed, which usually takes at least an hour, depending on the size of your pot. However, when I make this at home, I like to have some of the liquid remaining so that the dish is more like a stew. I find the “coconut broth” to be the most fragrant part of the dish, and I find it such a waste when it is diluted/soaked up by all the starches. 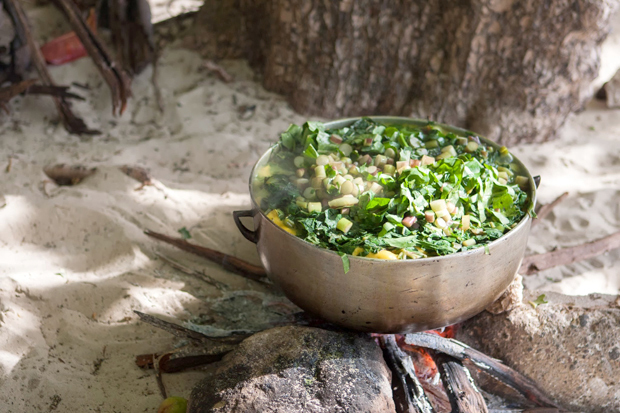 Still, the true, Grenadian way to eat this dish is to wait until the liquid is absorbed. 14. After the liquid is absorbed, gently remove each layer and separate it onto different platters. 15. When you plate the dish, add a little bit of each layer onto the plate: some meat, fish (tail! 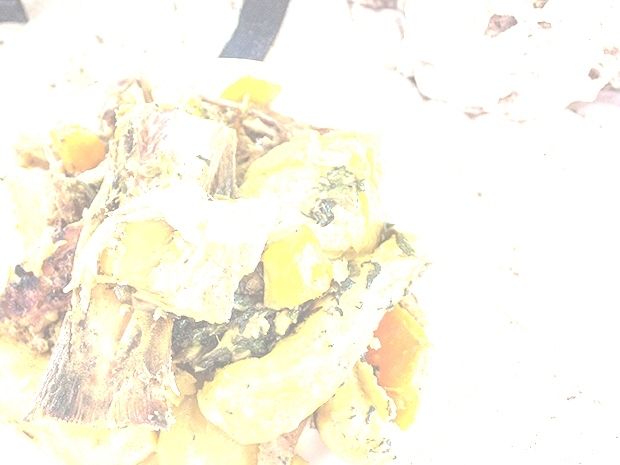 ), breadfruit, banana, yam, carrots, callaloo, cabbage, and dumpling. Dig in!